We will take the national flight (Quito – Coca) the route is 30 minutes. Once arrival to Coca airport our staff will be waiting for you to give you warm welcome and take you to the Francisco de Orellana Port –which is only 5 minutes away from the airport. Started our incredible adventure inside of Ecuadorian Amazon sailing in motor canoe by the Napo River the major tributary of the Amazon Rainforest in Ecuador. During the trip you will have the opportunity to look at the variety of birds such as kingfishers, herons and others with accompanied by awesome view. The box lunch will be provided in the trip. After two hours we will arrive to the dock entrance like stop to use the bathrooms and take short break to freshen up. We will continue our adventure taking a paddle canoe to arrive the lodge. Arrival to the lodge the kichwa community staff will assist to you and assignments of the cabins. You will feel peace and quiet in this beautiful place with the different sounds of the majestic Amazon that share with us this special moment. Early morning after the breakfast start the premium visit to the clay licks you will presence one of the most incredible nature spectacles you will ever see. It will only take us about an hour to get to the first parrot clay lick which is of easy access from the lodge. Once we get there, at about 7:30 or 8:30 am it will take just a few minutes for birds to show up. 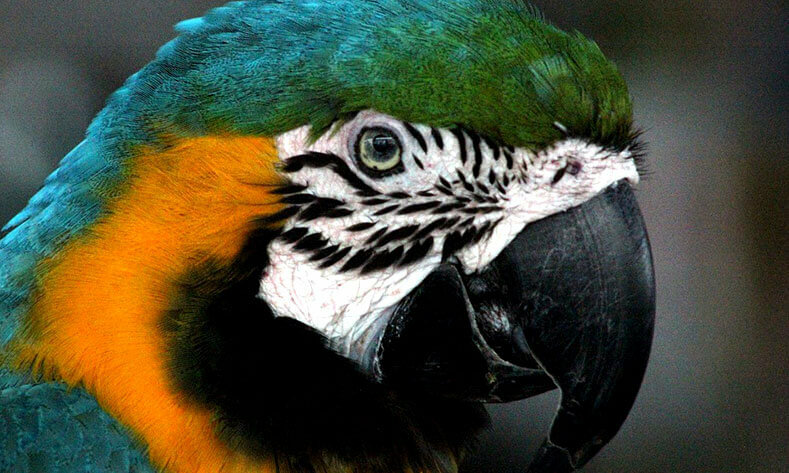 It is a real show of colors, about 11 species of bird such as parrots, macaws and parakeets visit it every day to feed with the minerals that are concentrated on the soil. Later on, we will hike along the forest trail to visit the community to share time with the men, women and children to learn about their every-day-life activities, routines, traditions and ancestral customs. Then, we will go hiking for 30 minutes throughout a Terra Firme forest until reaching the second parrot clay lick to seeing a great variety of birds during this visit our staff provides delicious lunch. Late in the afternoon we will arrive back to the lodge to rest and enjoy from our lodge social areas and comfortable rooms. 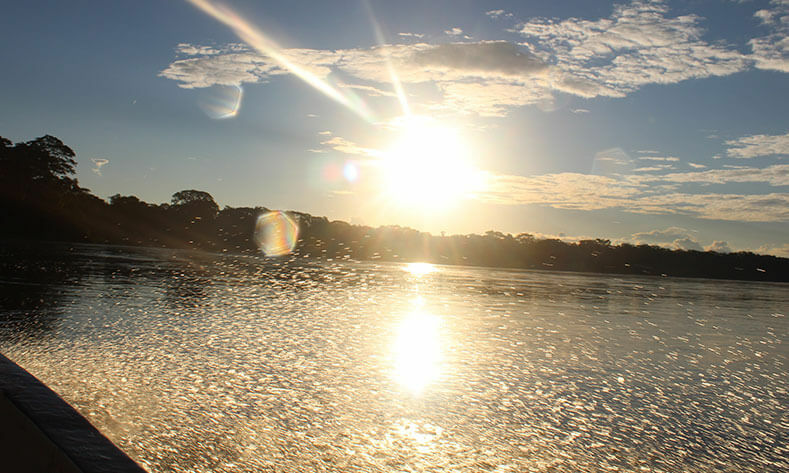 Early morning have breakfast and departure to the Canopy Observation Tower a high platform from which you will get one of the most amazing view of the Amazon. The tower is about 30 minutes from the lodge with 36 meters high was built just next a huge and ancient Kapok tree. You have to pass through different levels of the forest until arrive at the top, the birds that you feel impossible to observe while walking here will pass right through of the tower. 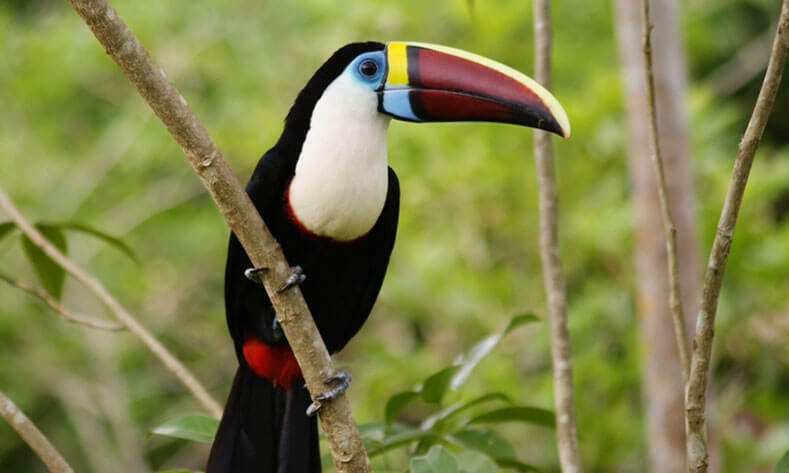 Flocks of vibrantly colored tanagers, blue-and-yellow macaws and large toucans. In the afternoon, after have lunch in the lodge, we will go the deep of the Amazon to discover the beautiful and mysterious wildlife that hides inside of the forest. There are great possibilities to see different species of monkeys, insects and even some snakes. We are going to explore the black water Lake and streams that are home of different species of fish and mammals such as the Giant Otter. The Lake is called black water because the sheets drop off in the river and these distill their colors in the water and the lake get this black color. Last Day, we will depart early after the breakfast to go back to Coca city and repeat the adventure. During the last excursion in the black water lake and Napo River is possible to observe variety of wildlife and biodiversity. We will take the national flight (Coca – Quito) the route is 30 minutes. Note: all this tour is subject to change during the excursions and weather inside of Ecuadorian Amazon.